Protect yourself, your family, your business, and your clients with confidential document shredding at Marin Sanitary Service. 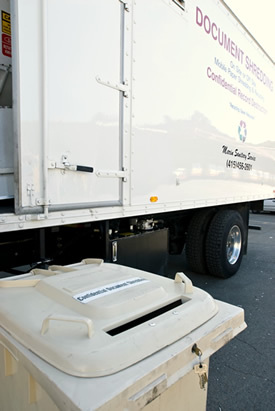 We offer safe, secure document shredding services for all of Marin County. Rest assured that your sensitive documents will be fully destroyed and fully recycled. Stay local – keep your recyclable materials in Marin! Keep your paper separate from the other materials to be shredded so we can recycle it! No metal hanging folders or plastic or metal clips. We cannot destroy hard drives. You can take them to Renew Computers at 446 Du Bois St. @ Andersen Drive and they will destroy them for nominal fee. You may drop off your sensitive documents at the Marin Recycling Center. Please make sure your documents are inside a secure lockable cart for later destruction. 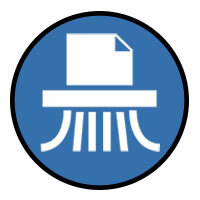 An appointment is required for witnessing document destruction and an additional fee will be applied. Witnessing appointments can be made by calling 415-456–2601. Witnessing appointments are not available on Mondays or Fridays. Monday – 8:30 a.m. to 4 p.m.
Tuesday – 8:30 a.m. to 4 p.m.
Wednesday – 8:30 a.m. to 4 p.m.
Thursday – 8:30 a.m. to 4 p.m.
Friday – 8:30 a.m. to 4 p.m.
Our shredding service will come to you! We serve all of Marin County, however, additional fees apply to areas outside of our contracted service areas of San Rafael, San Anselmo, Fairfax, Ross, Kentfield, Greenbrae, and Larkspur. Our mobile shredding van can come to you an on-call basis or you can set up an account and establish a regular pick-up service. If you set up an account, we can provide 64-gallon lockable carts to keep on site until it is ready for pick up, or we can provide you with smaller shredding consoles. Please note that a refundable deposit is required for all containers. We can shred the materials in front of you if you would like to witness the destruction (additional fees apply for this service).